Police had intended to tie life-line off to two backhoes. After some uncertainty, both pieces of equipment drove off without attempting it. Police officer throws large log up at Felix. After turning back workers and their equipment for the last several hours, police have arrived on scene and threatened to cut Felix’s life-line. This morning, Michigan Coalition Against Tar Sands (MI-CATS) is taking direct action in the Crane Pond State Game Area to halt expansion of Canadian corporation Enbridge Energy’s tar sands pipeline 6B. Enbridge’s claim that they have restored the Kalamazoo River after the 2010 spill holds no merit, nor does it justify expanding the pipeline. Tar sands cannot be cleaned up; this material is thick and heavy, it sinks in water, and clings to surfaces. Expanding the pipeline increases the risk of another disaster for all of life and future generations. Felix of the unconfined Kalamazoo River basin climbed into the trees early this morning to halt the expansion of Enbridge’s tar sands pipeline 6B. A rope traverse, spanning a portion of where construction is taking place, is the sole line that holds the platform they are sitting on up in the air. If it were cut and/or tampered with by police or workers they could fall from the tree, resulting in serious injury, possibly even death. MI CATS asserts that direct action tactics, including civil disobedience, are now necessary as Enbridge’s dominant presence in our bio-region has allowed no room for any constructive alternatives. After three long years of blatant lies and omissions, Enbridge has the audacity to triple the capacity of the same pipeline that poured an ecologically abrasive sludge into the Kalamazoo River. This catastrophe was the largest inland oil spill this continent has ever experienced. While the Kalamazoo spill was the largest, it is one of many devastations brought on by Enbridge. Enbridge’s insidious business practices caused more than 800 pipeline spills between 1999 and 2010; that is more than one tar sands spill a week. All pipelines leak. All markets peak. Capitalism can rot in hell. Enbridge places profit before our families, the ecosystem, our grandmothers, our dogs (yo what up Smokey*? ), our grandchildren and the future of life on this planet. The continuation of tar sands transportation through pipelines like Line 6B risk more than just our own backyards; everything in the industry’s wake is left defiled and in squalor. Our actions against Enbridge won’t stop until Enbridge stops participating in the resource extraction industry. We stand in solidarity with all first peoples’ whose lands were forcibly taken from them, Idle No More, Fearless Summer, those working to end corporate personhood, all the species going extinct, those sick and dying thanks to the extraction industry, and all folks fighting oppression in order to live full and happy lives. *Smokey was a dog who died as a result of the 2010 spill. 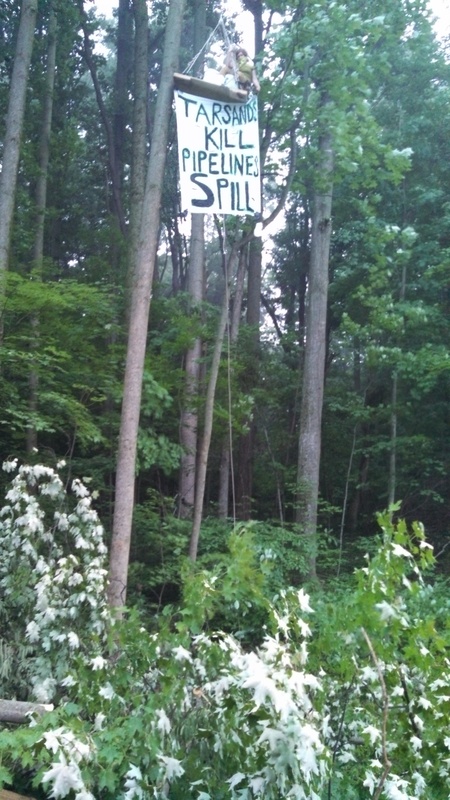 This is the third action MI-CATS has taken to stop construction of Enbridge’s Pipeline 6B this summer. On July 22nd they locked down to construction equipment, and on June 24 an activist climbed deep inside a section of pipe, halting work for the day.